"I needed to be in a room of people that had felt the same feelings and had experienced stigma but who but didn’t want to just sit back and accept it. They wanted to challenge the stigma, change attitudes and help others. It gave me purpose, direction and belonging." I also wanted to understand the world of mental health for my diagnosis and for others. 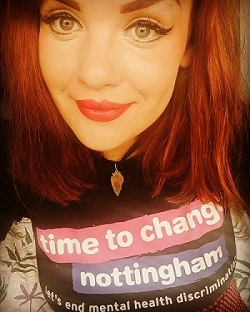 The Time to change Nottingham Hub was at its starting phase and I needed to be in a room of people that had possibly felt the feelings I had, experienced stigma but who but didn’t want to just sit back and accept it. They wanted to challenge the stigma, change attitudes and help others. It gave me purpose, direction and belonging. The training is focused on the stigma around mental health and how you can change attitudes. But there is also a lot more to it - you meet people, share stories and build on yourself. I really like the fact that the training includes a section on how to protect yourself, I think it is really important and really focused my attention on self-care. I find now as a champion I am more active in my self- care . I went on to do facilitator training so I could deliver the training sessions myself for others. This improved my confidence and ability to challenge difficult topics around mental health in a correct and safe manner. As a champion I have taken part in various activities to challenge stigma. From activities such as walking out of darkness to conducting talk days and delivering presentations on life with a diagnosis and the stigma around mental health in both my community and work place. 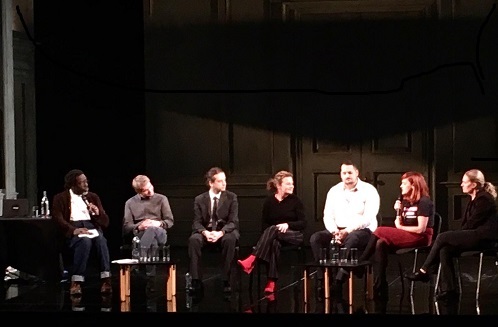 I’ve also sat on a mental health discussion panel at the playhouse Nottingham. It’s important to build up to doing activities step by step and our area trainer Anita was very inspiring and encouraging of this. At first I didn’t get it but over time it became clear. Take it at your pace, share what you feel comfortable with sharing and always check in with yourself and other champions. I am always happy to attend any event and share my story in order to make others feel less alone. Being a champion has really empowered me to own my diagnosis without fear or guilt. I have now started my own support group for PTSD along with a mental health council for staff in my workplace and have recently been nominated for two awards for my work in the community. Initially I struggled to challenge some people’s stigmatising comments, but over time I have found being a champion empowering and liberating. I do not shy away from correcting people on the terminology they use around me or others. I have gained myself. I know I’m perfect with our without my PTSD. I know that my story matters because it can help others find light in darkness and I think that’s an important message. Just doing one activity is enough and makes a huge difference to what others think about those of us with mental health problems. I don’t plan to stop campaigning until our city is free of stigma and discrimination for those of us with mental health problems.. I think together we can achieve it. As I always say… love and light keep up the fight we can break stigma if we unite!